Inter-Ministerial meeting for implementation of Prime Minister’s circular. The meeting is chaired by Senior Minister, HE Chair, Mr. Ieng Mouly, with key ministries including Ministry of Economy and Finance, Ministry of Health, Ministry of Planning and Ministry of Interior. Cambodia took a major policy implementation step in its national HIV/AIDS response this month when the Prime Minister approved a resolution directing operational funding for the response and other key advancements, notably the eligibility of all people living with HIV to receive a Health Equity Card and recognition of the important role played by civil society organizations. The resolution also guides the Ministry of Health to amend policies for health center and hospitals to use their own funds for HIV/AIDS activities, in addition to Ministry’s national budget. This achievement represents the culmination of an extensive effort by HP+ Cambodia and its health advisors, who are embedded at the National AIDS Authority (NAA), to advance health financing policy implementation for people living with HIV. This effort included sensitization and capacity building with the NAA leadership and ongoing support for the entire policy advocacy process including the drafting of the board resolutions and proposal to the Prime Minister’s office. Moving forward, the Prime Minister’s directive calls for the Supreme National Economic Council to further study the fiscal space to ensure implementation of the commitments and to sustainably mainstream the HIV/AIDS response through strengthened human resources, procurement, supply chain management, and health information systems. 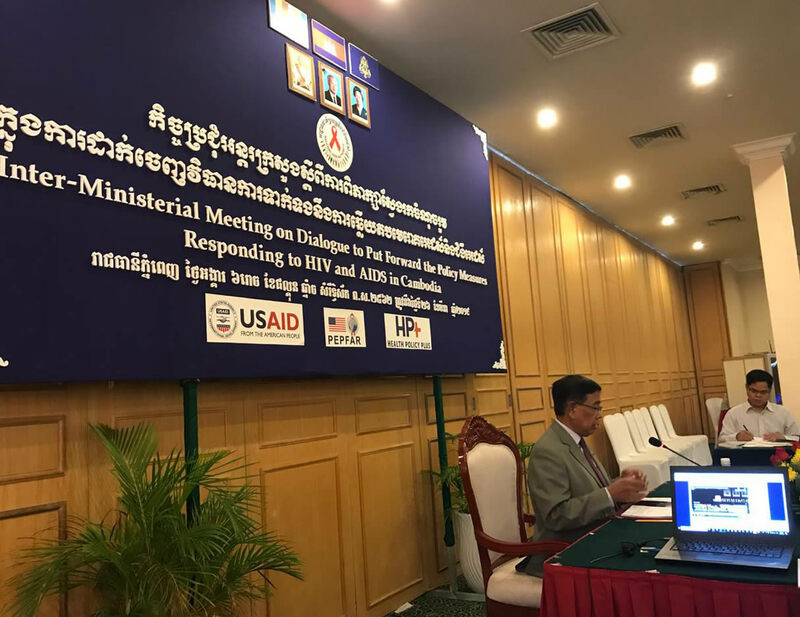 On March 26, an inter-ministerial meeting was held to advance next steps in implementation of the new policy with the technical and logistical support of HP+ Cambodia. The meeting was chaired by Senior Minister and Chair of the National AIDS Authority, His Excellency Mr. Ieng Mouly, and with representatives from the Ministry of Economy and Finance, Ministry of Health, Ministry of Planning and Ministry of Interior. The meeting’s objectives were to build understanding of the new policy circular – Sar Chor Nor – for a sustainable national HIV/AIDS response and identify action points and a timeline for a path to implementation.